ພວກຊາວອີຣ່ານ ພາກັນຖ່າຍຮູບ ໃນຂະນະທີ່ ເຕົ້າໂຮມກັບ ພວກຄົນອື່ນ ໃນຈັດຕຸລັດ ອາຊາດີ ຫຼື ເສລີພາບ ຂອງນະຄອນຫຼວງ ເຕຫະຣ່ານ ໃນວັນທີ 11 ກຸມພາ 2019, ໃນລະຫວ່າງ ການສະຫຼອງ ວັນປະຕິວັດສາສະໜາອິສລາມ ຄົບຮອບ 40 ປີ. ໃນວັນຈັນວານນີ້ ເປັນວັນຄົບຮອບ 40 ປີ ໃນການປະຕິວັດສາ​ສະ​ໜາ ອິສລາມ. ບວນປະທ້ວງ ຈຳນວນນຶ່ງພາກັນ ​ຈູດເຜົາທຸງຊາດຂອງສະຫະລັດ ແລະ ອິສຣາແອລ. ປະທານາທິບໍດີ ຮາຊານ ຣູຮານີ ກ່າວປາໄສ ໃນລະຫວ່າງ ພິທີສະຫຼອງ ວັນຂີດໝາຍ ການປະຕິວັດ ສາສະໜາ ອິສລາມ ຄົບຮອບ 40 ປີ ໃນນະຄອນຫຼວງ ເຕຫະຣ່ານ ຂອງອີຣ່ານ, ວັນທີ 11 ກຸມພາ 2019. ໃຫ້ປະເທດຢຸດສະງັກລົງ ​ພະ​ເຈົ້າຊາຫ໌ ໂມຮາມັດ ຣີຊາ ປາລາວີ ທີ່ສະໜັບສະໜຸນ ໂດຍ ສະຫະລັດກໍໄດ້ຫລົບໜີອອກຈາກອີຣ່ານ ໃນເດືອນມັງ ກອນ ປີ 1979. ລັດຖະມົນຕີ ວ່າການຕ່າງປະເທດ ຂອງອີຣ່ານ ທ່ານ ໂມຮາມັດ ຈາວາດ ຊາຣີຟ ເຂົ້າຮ່ວມ ປະຊຸມ ໃນເລື້ອງ ການຈັດຕັ້ງ ຄະນະກຳມະການ ຕາມລັດຖະທຳມະນູນ ໃນຊີເຣຍ ຢູ່ສຳນັກງານໃຫຍ່ ຂອງສະຫະປະຊາຊາດ ໃນນະຄອນ ເຈນີວາ ຂອງສະວິດເຊີແລນ ປະຈຳທະວີບຢູໂຣບ, ວັນທີ 18 ທັນວາ 2018. Hundreds of thousands of Iranians, many chanting "Death to America," marched in cities across the country Monday on the 40th anniversary of the Islamic Revolution. Ballistic missiles and other heavy weapons were proudly displayed in central Tehran while marchers burned U.S. and Israeli flags. President Hassan Rouhani vowed to "continue our path and our military power." 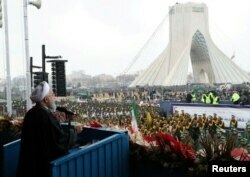 "I bow in admiration to Iran's resilient people who despite hardships and grievances, today poured into the streets by the millions to mark the 40th anniversary of their Islamic revolution, which some in the U.S. wished would never come," Foreign Minister Mohammad Javad Zarif tweeted. In his own tweet to mark the anniversary, President Donald Trump wrote "40 years of corruption, 40 years of repression, 40 years of terror. The regime in Iran has produced only 40 years of failure. The long-suffering Iranian people deserve a much better future." After more than a year of protests and strikes that paralyzed the country, the U.S.-backed Shah Mohammad Reza Pahlavi fled Iran in January, 1979. The exiled Ayatollah Ruhollah Khomeini returned and on February 11, 1979, after battling with rebels and guerillas, the army declared itself officially neutral, surrendering the country to Khomeini, who soon declared himself Supreme Leader. Later that year, Iranian students demanding the U.S. return the dying Shah for trial, seized the U.S. embassy in Tehran and held 52 Americans hostage for 444 days, leaving the U.S. nearly powerless to free them. The crisis was a severe blow to American prestige and its global image as an invincible superpower.